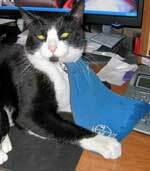 This is a testimonial to the virtues of the 2 cat bibs that we have owned for the past 6 years. We live in a mountain community were there are several pine siskins, chickadees, and juncos…many of them ground feeders. We put out our bird feeders all year round and since we have bought the cat bibs the older cat has caught no birds and actually seems to be so habituated to failure that we think we have him mostly cured of hunting birds! Our younger orange tiger is an avid hunter and spends his summer and winter days often beneath the feeder trying over and over and over again. He is not worn out yet, but he has had no success catching birds. Our photos are funny and so many people in our small town ask us what is on our cat so we spread the word as much as possible. Being a bird lover and watcher, the only reason we got the 2nd cat is because I was convinced that the bib was effective and that the cats would not be bringing us dead birds. Thank you for such and outstanding, helpful and environmentally important invention. I’m so happy to have found the Catbib and try to make others aware of it when I have the opportunity – at my vet’s or the local wildlife rescue center. 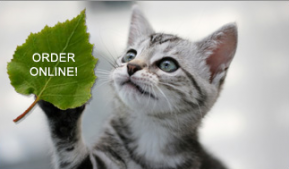 I know it works and think it brings a simple solution to a problem facing many cat owners. Our Enzo is a playful and lovable pet when he gets to spend time outside. But he loves the chase, and before the Catbib he was catching birds pretty regularly. Wearing the Catbib, he does not catch any birds, but for a few infrequent nestlings/fledglings who could not fly. 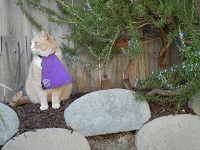 The Catbib enables us to give Enzo his adventure while offering some protection to the neighborhood wildlife. It has given us some peace of mind and a very happy kitty. No more broken hearts, finding injured birds. It all stopped with the cat bib. Rocket (who can fly-honestly-from the sidewalk up through the top of the screen door!) gets a wonderful neck and head massage when I put it on and off him, so he doesn’t mind. He really needs it in the spring and summer; it is essential. And it is so easy to clean, just washing it off. Thank You! In November 2012 I adopted CAT from the local animal shelter to help control the mice that are around and sometimes inside my house. She was picked up as a stray and a proven mouser. She did such a good job that I installed a cat door to allow to to come inside the house, and go out, at her own free will. She soon started bringing her trophies inside, and not always dead. It didn’t take long for her to start bringing in chipmunks, birds, and once, a flying squirrel, still able to ‘fly’. The only solution was to keep her inside all the time. That drove her crazy. 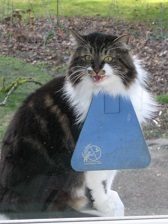 While searching the web, I came across the CatBib. I was skeptical but desperate, so I ordered one. It worked fantastic. As long as I was able to put the Bib onto her before she got out, she could not catch anything. She would stalk and pounce, but she could never get quite close enough to catch her prey. If she got out without the Bib, most of the time there would be a “present” waiting for me. Since putting CatBibs on my two cats last year, I am thrilled to report that neither has caught a single bird. What a wonderful, live-saving product this is. I am so grateful for the CatBib that I wrote about it my new book, Zooburbia: Meditations On The Wild Animals Among Us, just out from Parallax Press. The CatBib is mentioned in Chapter 16, “Peaceable Kingdom,” which is about my efforts to keep my pets from harming the local wildlife. 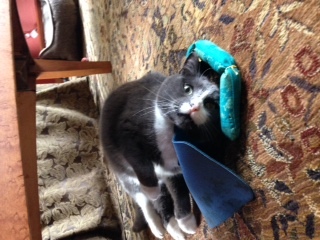 Attached is a photo of Puck, who proudly wears his CatBib in Zooburbia. Zooburbia is featured in the May 2014 edition of O: The Oprah Magazine as one of “Ten Titles to Pick Up Now.” It is my hope that my book will help spread the word about the CatBib far and wide, so together we can save the lives of more birds while allowing our cat friends to safely enjoy the outdoors. We live at the confluence of several bird migratory routes — an area rich in birds year-round, but especially in Spring and Fall. Without the bib, Phoenix used to catch an average of one bird a day, and now he rarely catches one. He did catch and kill a goldfinch today (so sad! ), however, while wearing his ‘small’ triangular bib, so it looks like we will need to graduate him to the larger square-shaped bib. 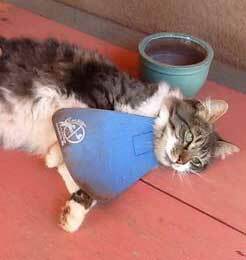 He gets funny looks from the other neighborhood cats (and people), but I’ve helped more than one neighbor find the solution to predatory cat behavior by recommending the cat bib! 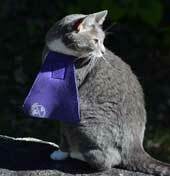 We have bought cat bibs from you for our cat, Boffen, for many years and are pleased with the results. I thought you would be interested in a recent development. Boffen cleans his bib! We used to have to change his bib every few weeks because it would get dirty when he was out in the grass and in the mud near the creek behind our house, etc.. We have two bibs and would put on a clean one and wash the other and hang it up to dry. But recently he has started cleaning his bib! He apparently considers it to be part of himself, so as he cleans his paws and fur and face he also licks any dirt off his bib! Attached is a picture of him with his clean bib which hasn’t needed to be changed for months. I have used the bib for over two years for my cat Lucy and it has almost eliminated her ability to catch birds. I have also noticed that she tends to stay out for shorter periods when the bib is on. She had no problem with getting used to wearing it ( she was 3 years old at the time) and I take it off as soon as she comes inside. Lucy has no difficulty with any activity other than stalking – she grooms, sleeps, etc and looks relaxed. I have put our phone number and the cat’s name on the back of the bib; all the neighbours know the cat and why she wears the bib. Lucy is the poster cat for our local bird rehabilitation centre, which sells the bibs. 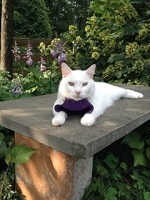 As this cat does spend some time outside, having the bib has made all the difference for local bird populations. Thanks so much for developing this simple and very effective method to reduce harm to birds. In complete despair over finding another dead bird, we discovered CatBib and ordered one immediately. That was almost four years ago and it has changed our lives. 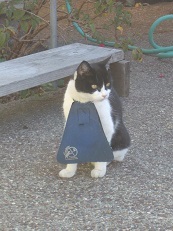 Our cat, Orca, adjusted to the CatBib right away – no issues at all – and wears it every time she goes outside. Before the CatBib, she killed birds regularly. Now, the birds are safer, Orca is happy, and we are thrilled. We are bird lovers and the CatBib has transformed our lives. We are extremely grateful for this simple solution a terrible problem. We have recommended CatBib to many friends and can’t thank you enough. Thank you! 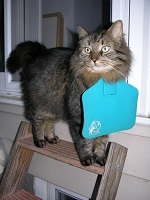 The large cat bib is working wonderfully with our magnetic cat door! The magnetic ball on his collar continues to work with ease and is in no way impeded by the cat bib – with no adjustments needing to be made to the bib at all. I just fasten it on in the morning before he goes on the prowl and he is able to come and go through the magnetic cat door as usual. It’s marvelous – thank you sooooo much! Feels good to know the winter feeders are only a buffet table for my feathered friends, and not my furred ones! 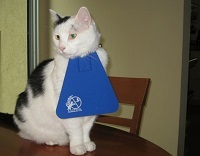 Here is a picture of our cat wearing his catbib. This is his second one as you can see he does get them dirty and wears them out. 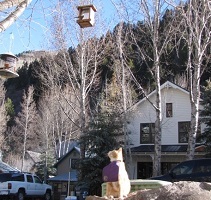 We live in the mountains in New Mexico and the catbib has effectively kept Greywolf from killing birds. We feed the birds and although he still likes to watch and stalk them, he has not killed any. We would know if he did because he brings his catches to us. While Roameo’s name and demeanor in this picture give one the impression that he is always gentle and loving, this cat is a menace to the lovely birds around our property. Thanks to CatBib, Roameo has not been able to catch one bird since he’s been wearing it. This is one of our cats. Her name is Pickles. She’s a very good hunter and I’ve still seen her get rodents, voles and shrews with the cat bib on (which I’m completely fine with) but I’ve never seen her get a bird (or seen feathers from a kill in the yard) since she’s had the cat bib on. We had to trim hers because she holds her head very low when she walks and kept tripping on it (she’s also a relatively small cat). Since we trimmed it to fit her though she runs and walks without a problem and barely seems to notice it. Thanks for a product that saves the birds and lets my cats stay outside! Our cat Tootsie has worn a bib for about seven years. She is of barn cat parentage and can slash a bat from the air as it flits past. The bib turned her from a bird-a-day cat into a mouser. As a cat and bird lover, I appreciate the bib so much that I wrote an article about it. You are welcome to link to it from your website if you want. Thank you for a product that solved a truly troubling problem. Our cat Bizzy has been wearing his catbib for over a year now, since he was about a year old. He’s gotten quite used to it; while I wouldn’t say he LOVES his cat bib, he doesn;t seem to mind it. On occasion, I’ve even found him preening it, as if it were his own pelt and giving a whole new meaning to Neoprene, the material it’s made of. When people ask about it, I tell them he’s a messy eater. He’s a voracious hunter much to my chagrin–I’m a wildlife biologist. One of the reasons we got him was to keep down the rodent population on our hobby farm. While he seems to be doing a good job of that, he started seriously stalking birds once he’d cleaned out the mice, then the shrews. So we got him a cat-bib last summer. It cut down his bird kills dramatically–he’d still catch an occasional bird but less than one a week. Thanks for an excellent product and keep the innovations going! 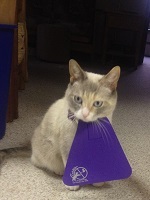 We’re pleased to have the opportunity to offer a testimonial about our new CatBib. Our dark tortoiseshell, Alex, is an extremely proficient hunter whose prey of choice is small mammals — mainly mice, voles, and shrews, but also young rabbits and even squirrels. Our house is in a semi-rural area, and during the spring we were finding four to six small bodies in our garden each week, until we discovered the CatBib. Now we’re down to just one or two casualties per week — a much more manageable toll. As you can see from the attached photos, Alex doesn’t mind the bib at all, and dozes in it perfectly happily when she’s not in predator mode. Azulita wearing her cat bib, taking a rest after running, playing, and jumping. She started chasing the birds a lot, even catching one, I put the cat bib on her and no more birds for her, they have a chance to get away. I am convinced cat bib works. Thank you so much for letting me enjoy my cat and my birds!!!! I just wanted to thank you for your wonderful product, the catbib. I have only had it for about a month or so and it has already made such a difference. No more dead chipmunks or birds! My husband thought our cat would never wear it but how wrong he was. He was about 9 months when we adopted him from the Animal Control and had been a stray so he was used to living outside. We tried for a year or so to keep him in but he was miserable. Then we allowed him out in our backyard and little by little he was an outside cat again and much happier. The problem was he is an awesome hunter. When I looked up online what we could do to stop the hunting, I found your website and decided to order the catbib and one of your collars. I was going to wait til the end of the summer to email you with the results but it is working out so well that I thought others should know too. I would highly recommend this product for cat lovers and nature lovers. I came across this picture of my cat Thomas wearing his bib and thought I would send it to you. He wore the bib for about a year and a half and then stopped going after birds. He hasn’t ad to wear it since and still leaves the birds alone. I just wanted your company to know how well the bib worked for us and to share the pic. Thanks for a great product. I’ve been meaning to write you for some time, but it’s been harder than I thought to get a photo of our happy cat in her CatBib – It really doesn’t slow her down at all, which makes for difficult photography! We ordered our CatBib over a year ago, after we discovered that our newly-adopted shelter cat was a consummate killer of birds. Her adoption paperwork noted that she had a strong “pray drive” but we quickly realized that should have read “prey.” She killed a minimum of one bird each day she went outside during her first week with us, from song sparrows to chickadees to one small but fleet Rufous hummingbird. That was the final straw – We ordered a CatBib knowing that if it didn’t work, she’d need to be an indoor cat only. Luckily for her and our local birds, the CatBib was just the thing! She hasn’t managed to kill a single creature outside while wearing her bib (she can still take out insects inside when she’s not wearing her bib). The one day a friend let her out without the bib, she brought back another dead chickadee for us – She hasn’t lost her skills, it’s just that she can’t work around the CatBib. Thanks for creating and selling this product. You’ve made it possible for us to keep our cat happy without leaving death in her wake and on our consciences. I thought I would let you know what an outstanding success the cat bib has been. Since putting it on George we have had not one bird or rabbit and we were getting several each day. He doesn’t mind the bib at all, although he has a strange gait which has caused great hilarity within our small rural community. I can’t begin to tell you what a great relief it is not to have to pick up and dispose of the poor creatures he caught or even worse, the half live ones I had to deal with. Many thanks for a fantastic product which succeeded when all else failed! Please feel free to use my comments as a testimonial and I will certainly sing your praises to all of my friends and colleagues. I bought a cat bib from you right after Christmas, the day after my darling Kit Kat killed 4 birds! The bib is fabulous and we have not seen a dead bird since. She now begs to have her bib put on when she wants to go out and jumps into one of our laps when she comes in her door and asks to have it taken off! Right on schedule. Thanks. You have given all of us (Kit Kat, Bill and Liddy) a new lease on life. Dear CatBib Folks, Thank you for the CatBib. It really works. Our cat Mazzy is a ferocious hunter and was bringing birds back to the house daily:( I was hoping there was something that could be used to stop her from hunting, but still allow her the freedom of the outdoors. The CatBib did the trick. She still brings gophers back but not birds and I can live with that. (Sorry gopher lovers). Although she drags it in the dirt at times, the Bib is very durable and can be rinsed and reused repeatedly. 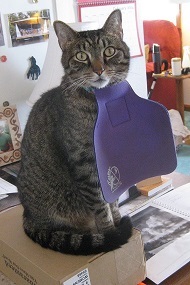 The CatBib has undoubtedly saved many birds around our house. I wish other cat owners would use this product with their outdoor cats. Attached are some pics of her with her new Bib. Thanks again.